People come to us and we apply a stressor to their body. We apply that stressor in the hope that we get a certain response. That really feeds in to the idea of what I call the Physiological Buffer Zone. So, a buffer zone is really just an area between two points. And in terms of the Physiological Buffer Zone, we’ve got a point of physical capacity and a point of breakdown, injury or pain. I’m sure most of you guys can think of an athlete or a client or someone who you’ve worked with who has this enormous Physiological Buffer Zone. They can train for hours on end. They can do crazy amounts of volume and intensities. They compete regularly without breaking down and their body tends to tolerate this stuff very well. They seem to not be the person who has any problems. Then, you can probably think of someone who is the total opposite . . . whose Physiological Buffer Zone is much smaller and any little thing that you do, maybe you push just a little too much, and all of a sudden, they blow up. Maybe they compete just a little bit too long and that turns into an incident, maybe not a catastrophic injury like a horrible muscle pull but like a tweak . . . “My shoulder feels a little bit sore today.” Whatever sore means to them, or however they perceive that. They have high levels of fitness, and . . . They have high stress resistance. Patrick shares his views on what the “physiological buzzer zone” is and how stress, fitness, fatigue and training all play a role in how athlete responds to training. In this lecture, Charlie Weingroff is joined by Patrick Ward in a discussion on the goal of manual therapy, and its effect on threat perception. They specifically cover discomfort in therapy, and when and how much pain is tolerable under different circumstances. 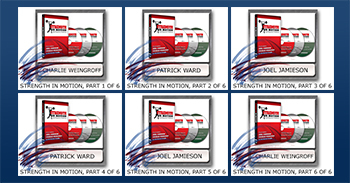 This is a collection of the videos from the 6-part Strength in Motion workshop video featuring Joel Jamieson, Patrick Ward and Charlie Weingroff.